We have several packages to choose from. There is a choice of appetizers such as: Shrimp Cocktail or Stuffed Mushrooms or Lump Crabmeat Cocktail, or Shrimp Lejon. Main course choices: Filet Mignon, or Salmon, or Roasted Chicken, or Glazed Tuna Steak. Your main courses are served with Roasted Red Bliss Potatoes and your choice of vegetables. There will be a chef choice dessert which will tantalize your palate. 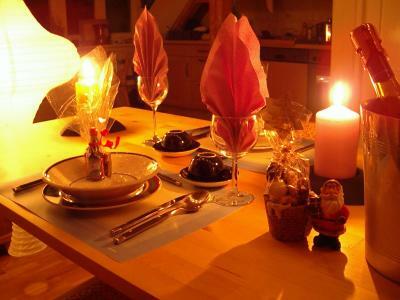 If you don' t like our choice, you can create your own romantic dinner and we will be glad to prepare it for you. Our package also includes a bottle of champagne.